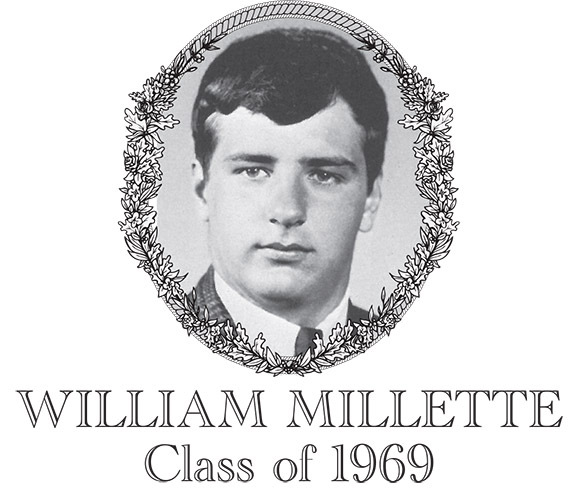 William Millette, Class of 1969, was a three-sport athlete at Bartlett High School. Bill played baseball, basketball, and football beginning in his sophomore year. Bill was an impact player on the football team earning varsity letters in all three years playing halfback, linebacker and defensive lineman. His reputation was that of a hard-nosed runner on offense and a quick, hard-hitting tackler on defense. As a senior, he was chosen to be a Captain and would lead the team in scoring. For his efforts, Bill received the Alumni Award as the outstanding running back, and the Veteran of Foreign Wars Award at the conclusion of the season. Bill also excelled in baseball while at Bartlett. He was an outstanding pitcher and 3rd baseman for the Indians. In his first start as a pitcher in his sophomore year, he struck out fifteen batters while surrendering just three hits in a win over Tourtellotte High School. During that season, he led the team in plate appearances, runs batted in, and batting average (.347), leading Bartlett to a 15-3 record. As a junior Bill was the number one starting pitcher. In a game against rival Southbridge he pitched 12 innings to beat them 2-1. Webster Times columnist John Bialy wrote that "Billy was a naturalist in athletics and considered one of the best pitchers in Central Mass." Over his 3-year career, Bill batted .322 and was a three time Border Conference All Star (including the first ever such team his sophomore year). His teams won a combined 39 games, qualified for district play 3 times, and were conference champions twice and co-champions once. Bill also accomplished an unbelievable .405 batting average while playing American Legion baseball during his high school days, a rare feat in Legion play. Under the tutelage of Don Cushing, Bill participated in basketball during both his junior and senior years during which Bartlett won the Tri Valley Tournament defeating heavily favored Southbridge, and also qualified for the District Tournament. Following graduation, Bill attended the University of Tampa. Currently Bill is self-employed and lives in with his wife Christine in Pomfret, CT. They have one son, Derek.